Here are the answers to the most commonly asked questions about Visio Online. If you are looking to get started, see View, create, and edit a diagram in Visio Online. Got a gripe? Feature request? Send it to us! At the bottom of the page on the status bar, select Give Feedback. Is Visio Online available with my Office 365 subscription? In general, Visio Online is available to all O365 commercial subscription plans, which include Office Online. Administrators and users can check which license they are a part of by following the steps in What Office 365 business product or license do I have? Note Visio Online is not supported in SharePoint Server. How does Visio Online impact Visio Web Access (also called Visio Services)? What if something doesn’t work in Visio Online that used to work in Visio Web Access? Editing hyperlinks in Visio Online If a shape has a hyperlink that was added in Visio, you can follow the hyperlink by clicking on the shape. Hyperlinks are also available in the Shape Info pane. For more information, see View shape data in Visio Online. Hyperlinks to network paths .As a workaround, you can copy the hyperlink path from Shape Info Pane and paste in a Run (Windows+R) window. Some languages The experience for Azerbaijani, Bosnian Latin, Dari, Hindi, Irish Gaelic, Kazakh, Macedonian, Malay, and Welsh languages. These languages will default to English. SharePoint External Lists Refreshing data-connected Visio diagrams linked to SharePoint External Lists as a data source. 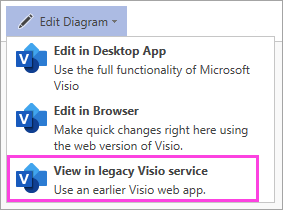 If you need to open your diagram in Visio Services (also called Visio Web Access), in Visio Online click Open Diagram, and then select View in legacy Visio service. Which web browsers does Visio Online work with? See the "Desktop and laptop computers" section in Office Online browser support for a full list of browser support options. In which languages is Visio Online currently available? The languages supported depends on the Visio Online edition.